I am leaving now, again, for Cleveland for the "short" car ride. Most of my fellow delegates have called and we speak frequently about our work and the logistics of nominating your candidate for President this week at the Republican National Committee. Security is a concern as a lot has gone on in the world and there are those in the Democratic left that embrace "anything goes" when it comes to disrupting normal Republican National Conventions or electing a Republican president. But I am pressing on as your alternate National Delegate. 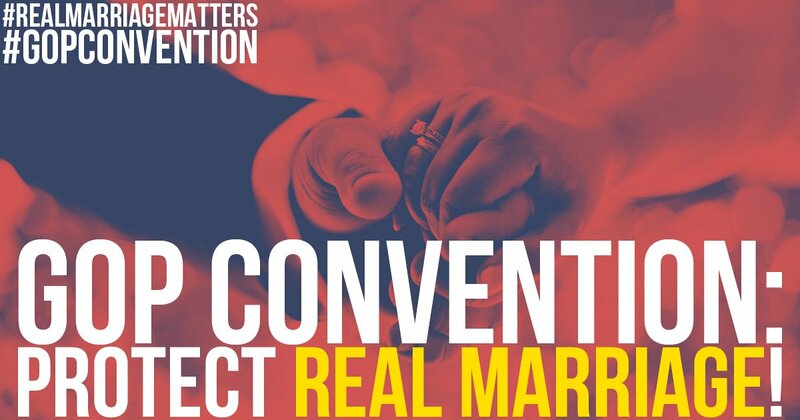 I attended the National Platform Committee Meetings Monday and Tuesday earlier this week to see members of the Platform Committee pass a more conservative platform than every before and to also pass a pro-marriage plank supporting one man-one woman marriage. I posted banners and signs around the meeting place of the Platform Committee. Today I started an online electronic campaign to reach all Cleveland attendants to pass the pro-family plank and the more conservative planks (pro-gun rights, pro-life, pro-marriage) in the Republican platform. I have an airplane flying over Cleveland and the Convention area with the words "Protect Real Marriage" and I am asking my fellow delegates to support the vote on Monday for that policy. This is the actual banner being flown on the actual airplane now (photo below). I have a social media outreach focused on the entire national delegates and alternates and their guests in progress and this has already reached 1000s of targeted online Republicans in Cleveland. This is the online banner advertisement that members of the news media, guests, delegates will see on their social accounts today, Sunday and Monday.